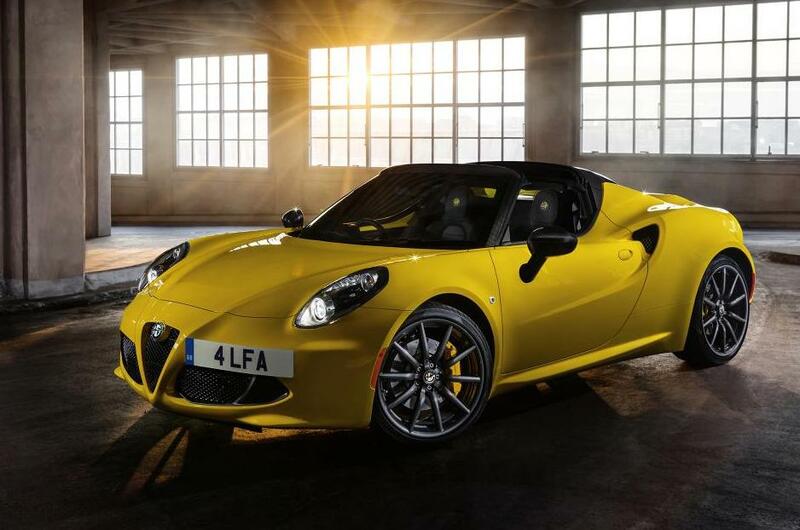 ORDER books for the new Alfa Romeo 4C Spider have officially opened, meaning customers can now get their name on the list at Alfa Romeo showrooms across the UK. Like its Coupé sibling, the new Alfa Romeo 4C Spider is built around an ultra-lightweight carbon fibre monocoque with minimal structural enhancements required in the transition from Coupé to Spider. The main developments include a new aluminium rollover structure, which is nestled underneath a black “halo”; a specially-developed carbon fibre windscreen frame and an engine compartment cross-member made from high-strength steel. The Coupé’s fastback rear end is replaced by classic and distinctive Spider buttresses and a new engine cover which also features three heat extractors and a subtle rear spoiler. There are significant changes to the front, too, with new, covered, projector-style xenon headlamps as standard on the Spider (and optional on the Coupé). Special attention has been paid to the aerodynamic characteristics of the Spider to ensure minimal wind and noise intrusion when the cloth roof is removed and stowed away, and for those owners who want to use their Spider all year round, a carbon fibre hardtop will be available as an optional accessory at a later date. A new carbon fibre air intake system, engineered to provide additional transmission cooling for track-focused drivers, also joins the options list, while a number of all-new wheel designs debut on the 4C Spider too, either in 17/18-inch (front/rear) or 18/19-inch sizes in silver or dark finishes. The exterior features are rounded out with a vibrant new pastel Giallo Prototipo (yellow) paint option. Inside, a new Alpine head unit and standard Alfa Hi Fi sound system offer improved audio quality, usability and device connectivity, and to further enhance the Spider’s cabin ambience, new options such as premium leather with accent stitching and matching door cards will be offered later in the year. Powered by the same, all-aluminium, 240hp, 258lb.-ft., 1750 TBi engine as the Coupé, performance is on a par with the hardtop model, with a top speed of 160mph and a 0-to-60 time of less than 4.5 seconds, as well as the capability to generate the same 1.1g of lateral acceleration and 1.25g of braking deceleration as the Coupé. The Alfa Romeo 4C Spider is priced from £59,500 OTR with an enhanced standard specification in line with the revised Coupé, including the upgraded audio system; luxury floor mats; glove compartment with leather cover; bespoke car cover and car care kit – plus parking sensors and cruise control available as free options – in addition to its carbon fibre windscreen frame, new wheels and fared-in xenon headlamps, which are standard on the Spider.